Ham and Swiss go together in more than just a tasty sandwich. Showcase these flavors in this scrumptious Ham and Swiss Au Gratin; it’s great for brunch, Easter, Mother’s Day, or as a beautiful side dish at dinner! If you flip through the recipe section of this blog, you’ll find that I have more breakfast/brunch recipes than any other category. I love brunch, it’s my favorite. However, I hate cooking first thing in the morning unless I’m really looking forward to what I’m making. Enter the Ham and Swiss Au Gratin. It’s a great alternative to most morning potato dishes, and it packs a lot of cheesy goodness and protein. 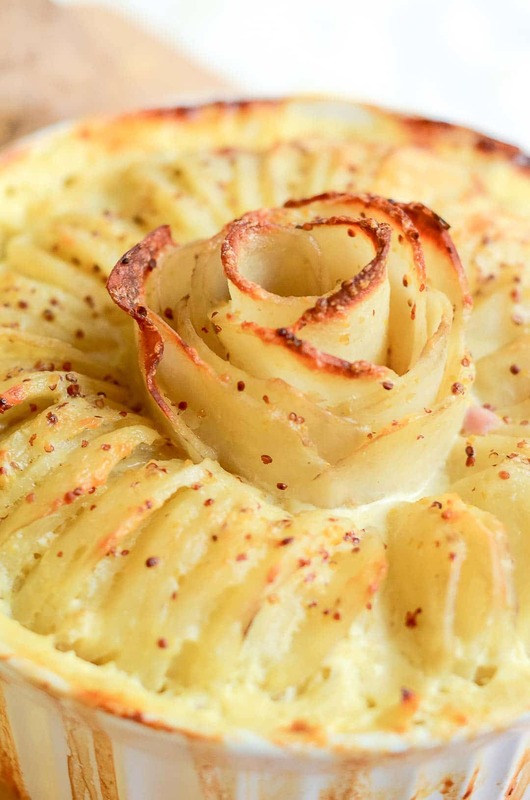 Plus, if you do the little potato rose on top, it makes for a great showstopper dish at a get-together. To help you make this Ham and Swiss Au Gratin rise to the glory it deserves, master these culinary proficiencies first. Béchamel Cream Sauce. This au gratin has a slightly varied version of this recipe, but the tips and tricks in this informative post are invaluable. How To Buy & Store Eggs. Find out how to decipher all the grocery store lingo and get the right eggs for the job. Place the leftovers in an oven safe dish and cover it with aluminum foil. Bake for 30 minutes or until heated throughout. I like to add a fresh grating of cheese on top before baking. It helps freshen it up and make it taste less like leftovers. 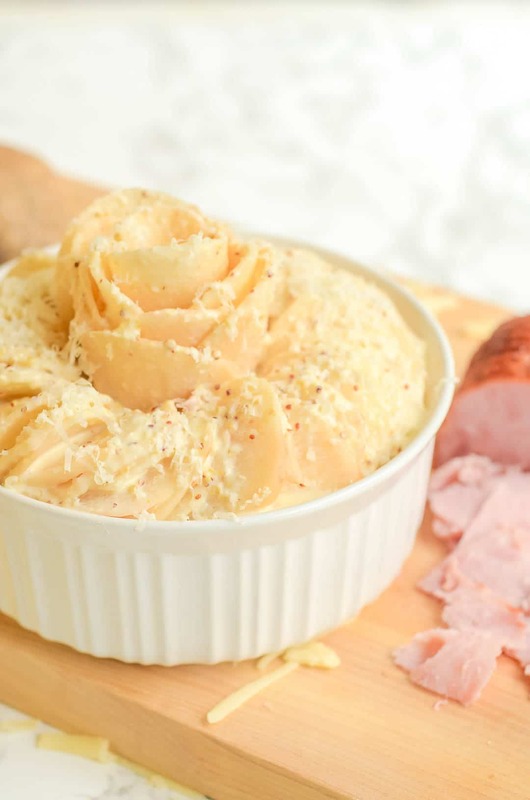 My favorite part of this Ham and Swiss Au Gratin is the cute rose on top. It’s really simple to make, just make sure that you buy one super large potato to have pieces big enough for it. Roll one piece tightly to form the center and skewer it with a toothpick to help it hold shape. Put a second toothpick going through it so they crisscross, then work one piece at a time to create the petals. Continue to use the toothpicks to help it maintain it’s shape, and work until the toothpicks have been filled. Get the free printable grocery list for this Ham and Swiss Au Gratin recipe HERE. This grocery list has everything that you’ll need to make this Ham and Swiss Au Gratin recipe. To help in making grocery shopping simple, each ingredient is listed in easy-to-find grocery store amounts. If there is no amount specified, that means that you can buy the smallest (or largest) container available and still have plenty left over. In a heavy bottomed pot, melt the butter and add in the flour to create a roux. Cook for 1 Minute. Remove from the heat and slowly stir in the heavy cream until incorporated. Add in the milk, dijon mustard, and gruyere cheese then whisk in the eggs. Set aside. In a 1.5 quart baking dish, or an au gratin pan, make a layer of the sliced potatoes so that they are all slightly overlapping and laying (mostly) flat against the bottom of the dish. Sprinkle 1/4 cup of swiss cheese on top, then add a layer of the sliced ham in the same fashion as the potatoes. Top the ham with another 1/4 cup of swiss cheese. Repeat for 3 layers. Spoon half of the sauce over the top layer allowing it settle into the cracks of the au gratin before adding more. 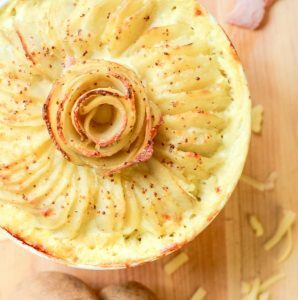 For the top layer, stack two potatoes worth of slices together on their side (Hasselback style). Slowly start to spread them out like you're spreading out a hand of cards until a complete circle is made. 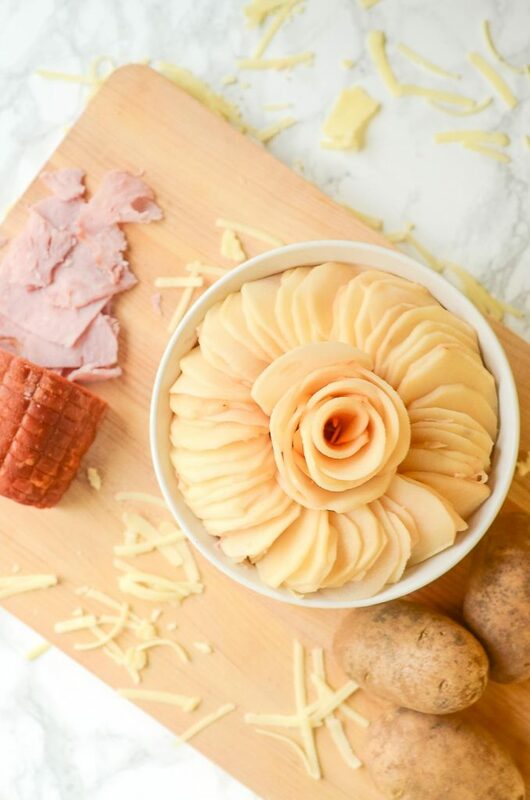 Do the same with another potato worth of slices to fill in the circle, or make a decorative rose. Spoon the rest of the sauce over the top of the au gratin, allowing it to settle in before adding more. Sprinkle a little extra gruyere or Swiss cheese on top of the gratin and place the baking dish on a sheet pan. Cover the au gratin with aluminum foil and bake for 90 Minutes. Remove the foil and bake for another 15 Minutes, or until the cheese on top is browned. You may not use all of the sauce as you make your au gratin. This recipe is such a stunner! Beautifully done, Mackenzie! You’re so sweet, Megan. Thank you! It looks so beautiful and delicious! I love the little flower from the middle 🙂 Have a great weekend! Thank you so much Cristina! That flower really does add an element of beauty to it, doesn’t it? I hope you get to try making this soon Adriana! That looks so pretty and I bet it was so delicious…!! I love the combination of ham and potatoes. Love the few crisp tops. Such a pretty dish … perfect for special occasion brunches! … Like Saturday. Or Sunday. I love prepare ahead dishes – not so much because I don’t like to cook, but that I usually wake up hungry and don’t want to spend time prepping … start eating asap! I’m just like you Noel. I’d always rather spend some time the night before prepping breakfast than wait a few hours after waking up to eat! This is so pretty and easy to make too. 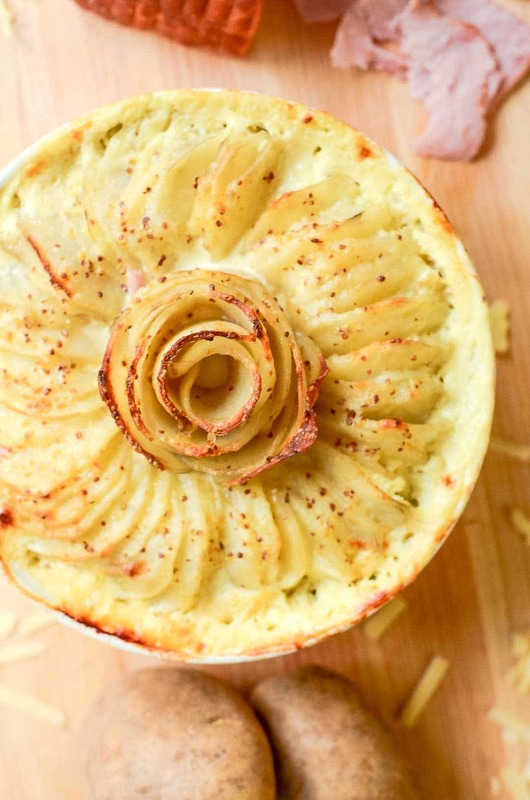 I love the combination of potato with cheese and bookmarking this to try later. I always look at this and see a rose, but I’ve never noticed it looking like a crown before, Mari! I totally see it now that you’ve said it! I love it! Your dish really looks amazing and with the ingredients, you are using I’m sure it’s delicious!! This would be a dish I would serve for company or visiting family. I can imagine the ooohs and ahhhhs when you present it. I’m pinning!! Those ooohs and ahhhs are always part of my enjoyment in making this au gratin. It’s always a showstopper! This is SO pretty and sounds SO delicious. LOVE the presentation. What a way to impress you dinner guests. Simply stunning. I have to admit, the response when I bring this Ham and Swiss Au Gratin to the table always makes it worth the effort of making it! This is one seriously beautiful and delicious sounding au gratin! This would be perfect to pair with chicken or steak and even for holidays! You’re so right, Jessica! I usually pull it out for the Holidays (especially Easter or Mother’s Day) because of the time it takes to prepare, but the “oohs” and “aahs” I get when it hits the table always makes it worth it! This is such a gorgeous dish! What a beautiful presentation and the flavors sound amazing together. This is so beautiful! Such an elegant side dish for a special occasion. Thank you, Carol. It’s definitely a showstopper dish! This a such a delightful and beautiful looking recipe!! Loved the potato ?! Thank you so much, Soniya. I hope you enjoy it!